I got permission from my client (she did rightfully pay for this design) and I listed the things that I could actually find for you. The gold mirrors, and nightstands were both vintage finds from my beloved Craigs List. Similar options are out there...you just have to look and try to match the shape/finish/scale. The lamps were also a vintage find, but I found the ones pictured above that are a close match. So there you have it. The basics that make this room tick. Hope this scratches your itch for the details. If I missed anything you have questions about, just send me a note. Have a good one!!!! Ahhh see know I know where to get the lamp :) Thanks! 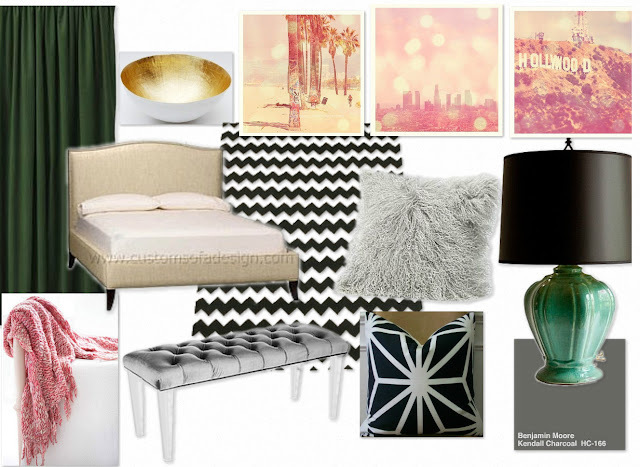 This has totally inspired me to finally redo my own bedroom! What is the material for the pillows?